More wonderful news from the Eicher family! Daughter Loretta and I are at home today while the rest are either working or at school. We did odd jobs around the house that have been neglected lately. I am excited to announce that Joe and I are grandparents now! Abigail Elizabeth was born to daughter Elizabeth and Timothy on Saturday, September 10 at 1:14 a.m. She is already so loved by all of us. She has a lot of black hair. She weighed 11 pounds and was 21 ¼ inches long. She lost one half pound in her stay in the hospital but is doing well again. Mother and baby are doing well for which we are so thankful. Daughter Verena is helping Elizabeth with household chores. She is also enjoying taking care of little Abigail all she can. Yesterday Loretta and I went to help Verena was a huge laundry at Elizabeth’s house. She had not been able to do laundry in over a week. Today is the first day I have not seen Abigail since she was born so I miss her already. I gave her a bath yesterday and she wasn’t too enthused about it. She lets herself be heard when she doesn’t like something. She is such a precious angel! So sweet and innocent and such a blessing from God. Friday I will go with Elizabeth and Abigail to their doctor appointments. Elizabeth had the baby by C-section so she is recovering from that surgery. Elizabeth had some complications during delivery so we are glad everything turned out okay. I was more worried about Elizabeth than I was for myself when I had babies. Elizabeth wanted me to be with her and Timothy. I spent Thursday night at their house with them and the midwife. Then I spent Friday night and Saturday with them at the hospital. I can tell I am still worn out from two nights of not getting much sleep. I was glad to be there for them and to help out wherever they needed me. My mother was always there for me when my first six children were born. She wasn’t living anymore when Lovina and Kevin were born. Oh, how I missed not having her with us. Now I want to do the same for my children if they want me to come. This weekend is set for youth deer hunting. Son Joseph will go try his luck to get a deer. Mose will accompany him. They were target practicing tonight. He’s getting excited to be able to go hunting for a day. We can’t use our neighbor’s woods for hunting anymore so they need to find more hunting places. Daughter Lovina, 12, and son Kevin, 11, just came home from our neighbor Joe’s house. They like playing with Joe’s daughter, Jaelyn. She likes to come over here, too, and enjoys all the animals on our farm. I forgot to mention that Joe is still good at burping a baby. He held Abigail and got her to burp when she didn’t for me. He was always good at getting our babies to settle down at night to sleep. He enjoys being Grandpa! 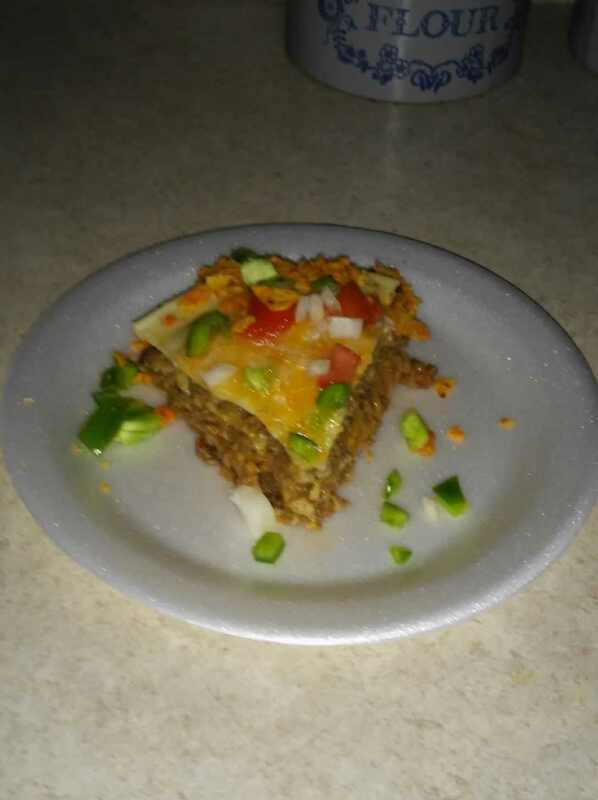 This week I’ll share the recipe for Dorito Taco Pie. Daughter Verena made it for supper last week. It was a new recipe she had and wanted to try it out. We had Banana Poppers with it. It was delicious and everyone like it. 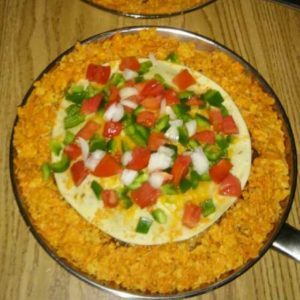 Sprinkle crushed Doritos around the outer edge of the tortillas. If you use a 10-inch skillet, use the Doritos to fill in the sides. Cover skillet with aluminum foil and bake at 350 degrees for 20 minutes. Remove from oven and top with remaining cheese. Return to oven uncovered for 6-7 minutes or until cheese is melted and edges of tortillas are crisp. Remove and top with tomatoes and onions before serving. Green peppers (diced) can be added too. Slice it like you would a pie. Previous PostSeptember means back to school, grilled stuffed peppers, and another weddingNext PostYes, Amish men help with laundry, and other post-baby tales! Congratulations for the new baby and so glad mother and baby are ok. The taco pie sure sounds good. Congratulations on the new family member!! Having a new one in the family is such a Blessing. Congratulations to everyone! Happy to hear everyone is doing well. Being a Grandmother is such a wonderful experience! Congratulations grand kids are so very special ! Congratulations. Hope Elizabeth & Abigail are doing good. It’s great to be a grandmother. I love it!! Congratulations to Timothy and Elizabeth on the safe arrival of their baby girl! and Congratulations on becoming grandparents. It sure is a mighty blessing and show of the Lords gracious and caring hands, having had our first child four months ago by C-section and with a few complications my thoughts are very much with Elizabeth. I’m not sure if this information would be already known but if available Elizabeth may wish to take some form of probiotics – I wish I had known this from birth but when a child is delivered by C-section they miss getting the good bacteria into their stomachs (can result in the baby being gassy and very fussy – my baby certainly was!) All the very best and look forward to reading updates on the precious babe! Is there an address where we can send a baby gift? Congratulations! Enjoy and love your grandchild! You will see how much Lovina is enjoying little Abigail in next week’s column!